The human body consists of about 35 trillion cells, so it could be said that overall body growth is the growth of individual cells. One essential nutrient for cells are amino acids, the building blocks of proteins (one of the three major nutrients). The presence or absence of amino acids regulates cell growth. 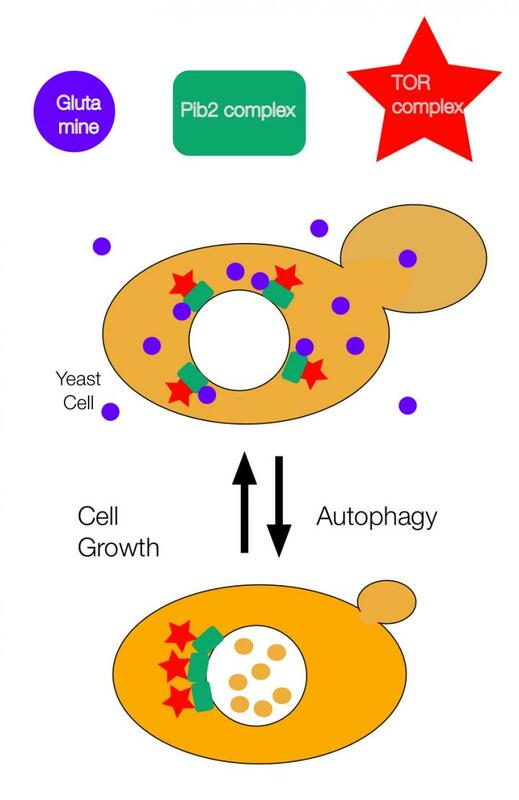 A research group at Osaka University led by Takeshi Noda discovered that TOR (Target of Rapamycin), an enzyme complex that played a central role in cell growth, controlled autophagy. However, how information of amino acids was transmitted to the TOR complex and which amino acid was detected were not well understood. This group noticed that Pib2 interacted with the TOR complex and examined its detailed mechanisms in budding yeast. Specifically, they examined the role of Pib2 molecules in a cell by cell biological methods, mutations of Pib2 by genetic analysis, and the binding of Pib2 complex to glutamine labeled with a radioactive isotope. In fact, both the Pib2 complex and the TOR complex were present on the vacuole in cells and bound or unbound according to the presence of glutamine. From these findings, the researchers found that the Pib2 complex bound directly to glutamine, activated TOR complexes, and regulated cell growth and autophagy. Their study results were published in PLOS Genetics. Hirofumi Ukai, the lead author of the paper, said "When I visited Ghana in West Africa as part of the Graduate Minor Program 'Cross-Boundary Innovation Program,' I learned about retarded growth in infants in developing countries due to deficiency of amino acids, such as lysine and threonine. After returning to Japan, I pursued my study while questioning which of the 20 kinds of amino acids were necessary for cell growth, verifying that glutamine was of particular importance." It is expected that the application of amino acids to nutritional science will bring triumph over cancer and other diseases as well as long-term survival.